The short-lived power trio Cream reached their apex with Wheels of Fire in 1968. This double album consists of one studio LP and one live LP, and it became the first ever platinum-selling double album, showing that the group had fully arrived just before they decided to call it quits. Wheels of Fire was produced by Felix Pappalardi, who also played various eclectic instruments and helped choose the live material to provide a showcase for each band member. Most of the studio material was recorded in London and New York during late 1967, while the live performances were captured in San Francisco during early 1968. Cream rarely performed any of their songs before they entered the studio. 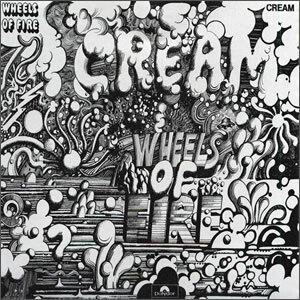 On Wheels of Fire, the studio material consists of two blues covers chosen by guitarist Eric Clapton along with original material composed by two distinct teams. Bassist and lead vocalist Jack Bruce teamed up with poet Pete Brown to write four of the studio tracks, while drummer Ginger Baker co-wrote three songs with musician Mike Taylor. During these sessions, Clapton did write the acoustic folk song “Anyone For Tennis” (on which he also sang), which was included on limited versions on the album but otherwise released as a single and featured in the movie, The Savage Seven. The entire studio album was completed before Cream recorded material for the live album. For these live recordings, Pappalardi used a mobile recording studio outside the Fillmore Auditorium and the Winterland Ballroom in San Francisco, where six shows were recorded. From these recordings, four extended tracks were chosen to fill the second LP. “Traintime” is a showcase for Bruce due to his performance of a bluesy harmonica solo, Similarly, “Toad” features a lengthy drum solo by Baker, much longer than the original recording from Fresh Cream. Clapton’s guitar again shines on the classic blues tracks “Spoonful” and “Crossroads”, with the latter Robert Johnson classic becoming so identified with Clapton that he used the title, Crossroads, for his 1988 box set. As an encapsulated package of the best elements of Cream during their duration as a group, “White Room” has become the group’s essential song. Written by Bruce and Brown, the song features a sharp, direct rock beat and a great riff accented by hyper Clapton’s wah-wah guitar. The ethereal refrain section shows the upper range of what this band can accomplish compositionally and the reprise of opening psych-influenced intro is nicely complimented by the sudden return to the hard rock of the outro. Brown’s lyrics have been interrupted as the recollection of a bad acid trip, but certainly leave enough room for interpretation to traverse the decades. The cover of Howlin’ Wolf’s “Sitting on Top of the World” is a heavy version of a classic 1920s blues song, with Clapton playing the type of blues guitar that Jimmy Page would soon adopt. The album then turns to some of its most original material. Baker and Taylor’s “Passing the Time” is a mulit-part song which starts as odd drum piece before fading into a completely different, psychedelic organ and viola fueled semi-ballad with some vocal harmonizing. A third section gives the song its title as a rock improve which again fades out as the light second section returns to finish the song. “As You Said” features Bruce on acoustic with some cello by Pappalardi and may be the oddest of Cream songs. In close competition for that title is “Pressed Rat and Warthog”, featuring spoken vocals by Baker, which he originally wanted his daughter to record. While on the surface this may seem like a farcical tune, the music beneath the voice rather interesting and dynamic. The rock returns with “Politician”, which features more of the bluesy, riff-driven music which defined Cream. Clapton recorded two overdubbed “floating” guitars which. crisscross in the stereo mix. “Those Were the Days” continues the rock groove but with unique elements such as the call-and-response vocals and the mythical lyric matter by Brown. The contemporary blues cover of Albert King’s “Born Under a Bad Sign” features a rotating rhythm by Baker, behind the screeching, whining guitars and slow-paced leads by “Slow Hand”. “Deserted Cities of the Heart” is the best song on the second side with a wild, almost funky rhythm but with a jazz/folk fusion, making this one a very rewarding listen and perhaps Cream’s most underrated song. Wheels of Fire was a raving commercial success on both sides of the Atlantic, reaching #3 in the UK and #1 in the US. However, shortly after the album’s completion, the members of Cream decided that they wanted to go their separate ways. At the label’s urging, they embarked on a “farewell” tour in late 1968 with nearly the entire set consisting of songs from this double album. One final album called Goodbye, another hybrid of live and studio material, was released in early 1969, after the band had dissolved.